Gastrin is a hormone that stimulates secretion of gastric acid (HCl) by the parietal cells of the stomach and stimulates gastric motility. It is released by G cells in the stomach, duodenum, and the pancreas. 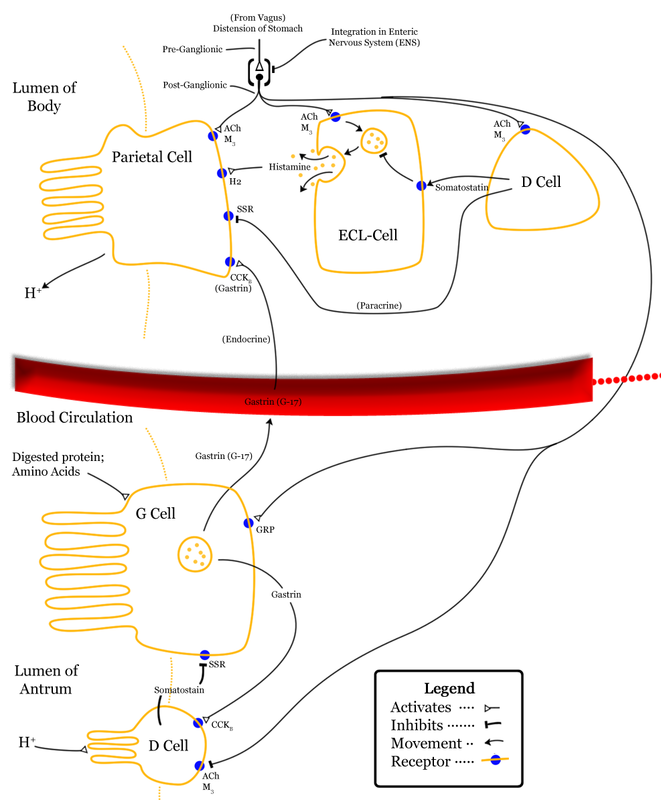 Gastrin, histamine, acetylcholine, and ghrelin stimulate whereas somatostatin, cholecystokinin, atrial natriuretic peptide, and nitric oxide inhibit acid secretion. Vagal excitation by hypoglycaemia (insulin) or pylorus ligation did not mobilize either gastrin or histamine. The histamine response to food was almost abolished by gastrin receptor blockade, and it was halved on the denervated side after unilateral subdiaphragmatic vagotomy. The effects of somatostatin (growth hormone release inhibiting hormone) on basal gastrin were studied in patients suffering from pernicious anaemia and chronic renal and liver disease, and during sequential arginine/insulin-stimulated gastrin release in normal subjects. When basal gastrin concentrations were normal (10-50 pg/ml) in controls and in patients who were in renal and liver failure, somatostatin had no effect on gastrin levels. Raised basal gastrin levels in pernicious anaemia and in 2 cases of chronic renal disease, were significantly inhibited by somatostatin with a half-life (T 1/2) of 3-4 minutes. Arginine infusion caused an insignificant rise in serum gastrin which was unaffected by somatostatin, whereas insulin hypoglycaemia significantly stimulated gastrin release, which was inhibited by somatostatin.